Keeny Karst / DNC Parks & Resort at Yosemite, Inc. Hike to Mirror Lake. Beat the crowds and watch the sun rise on an early morning hike to this lovely lake near the east end of Yosemite Valley. See Yosemite hiking. Breakfast at the Ahwahnee. Built in 1927, this magnificently rustic hotel is among the most beautiful in the U.S. It’s worth seeing any time. But breakfast in the Ahwahnee dining room, with its floor-to-ceiling windows and 34-foot-high beamed ceiling, is something special. Reservations recommended, especially for Sunday brunch. Hike to Yosemite Falls. Catch one of the valley shuttle buses to the trailhead for Lower Yosemite Falls, at its best in spring and early summer. See Yosemite hiking. Learn the park. With its new state-of-the-art exhibit hall, Yosemite Valley Visitor Center gives a good overview of the park’s geology and natural history; it’s also the starting point for many guided hikes and other park activities. Next door, the Yosemite Museum focuses on the cultures of Yosemite’s Native Americans, the Miwok and Paiute peoples. The Ansel Adams Gallery showcases the luminous work of Adams, who spent much of his career photographing the park; it also offers frequent one-day photo workshops. Gaze out from Glacier Point. From the valley take Wawona Road south then turn east on Glacier Point Road. 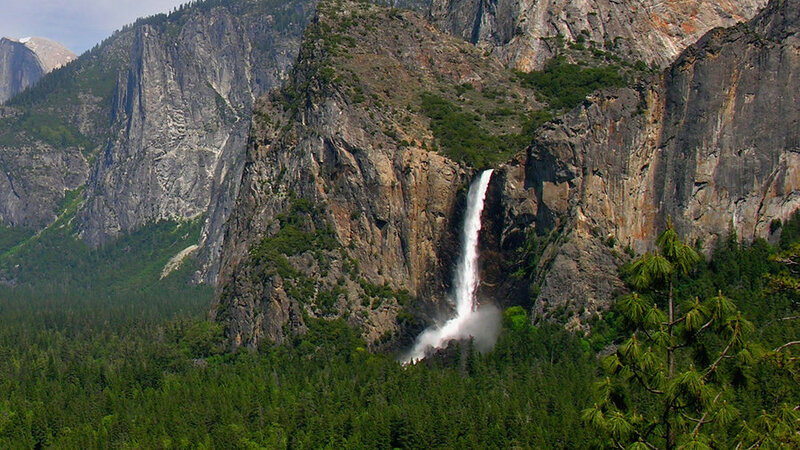 Follow it to its end for one of the best views anywhere: Yosemite Valley, Half Dome and the Sierra Nevada. If you feel like hiking, you have good options: nearby, the trail to Taft Point gives amazing views, too. Tunnel View Overlook. This classic view of Yosemite Valley is best seen toward late afternoon, when the sun makes the valley and the Sierra glow even more strikingly than usual. You’ll find the overlook on the Wawona Road, just below the tunnel.